CORCORAN, Calif. (KFSN) -- Between the year-to-year drought monitor maps showing significant improvements to California's drought situation to the announcement that California's snowpack is now 185-percent of average-- there is relief and optimism among many in the state, including farmers. 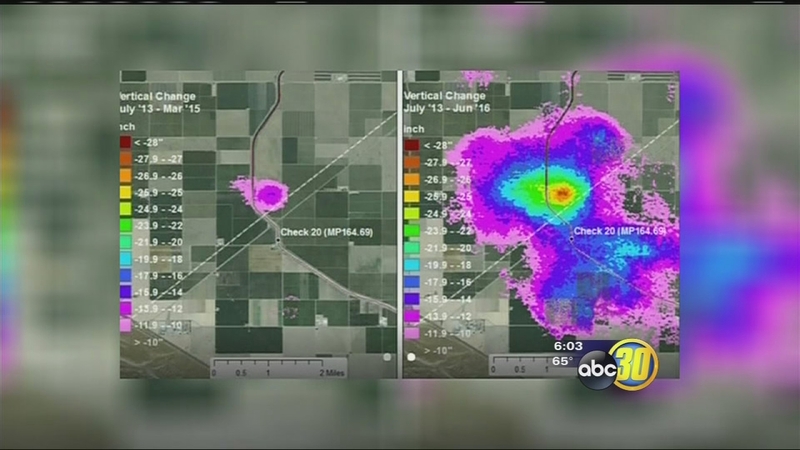 But new data released by NASA's Jet Propulsion Laboratory in Pasadena shows parts of the Central Valley are still sinking, or subsiding, due to excessive groundwater pumping, which increases during drought years. Using radar technology, members of the jet propulsion lab revealed a subsidence bowl around Corcoran has grown wider and deeper. Between May of 2015 and September of 2016, the maximum subsidence there was nearly two feet. That's about the same amount officials at Cross Creek Flood Control District in Corcoran say their levee has dropped over the past year and a half, due to subsidence. "And so the effort right now is to raise that levee up several feet in anticipation of the water that will come in the summer," said Kindon Meik, Corcoran City Manager. Corcoran's City Manager says crews are continually moving dirt to widen the base and increase the height of the levee, in case of a catastrophic flood event. Subsidence has also put one of the city's nine domestic wells out of commission for a few months. But the hope is that subsidence will stop, or slow, if farmers choose not to turn on the pumps in the coming months. Both the drainage district and Corcoran city officials are urging residents to purchase flood insurance, in case of a severe flood event. To see the subsidence report, click here.